I was very late to the RTS gaming train. My gaming time was mainly spent toiling away in grindfest MMORPGs and honing my profanity usage by playing Call of Duty and Halo on Xbox live. When I started my first real job out of college, I was introduced to the world of Starcraft 2 and eSports. My team, “Studio 1″, would huddle around a tiny monitor to watch FruitDealer dominate effortlessly in the GSL Season 1. Eventually, I was hooked. I wanted to be part of this phenomenon. But, to play Starcraft 2, I needed to pick a race and stick with it. And that was all. Terrans shoot things. Zergs are bugs and Protoss are too shiny. With that flawless logic, how could you possibly go wrong? With Heart of the Swarm just around the corner, it was time to pay homage to the game that started it all for me: Wings of Liberty. Prep time should be about 25 minutes. Idle time can be from 2 to 24 hours to allow the chicken to marinate. Cook time is about 45 minutes. This recipe will feed 3 to 4 people. Finely chop your cilantro and garlic. In a bowl, combine your cilantro, garlic and line juice. Stir in sriracha into the mixture. This will create a marinade for the chicken. Rub salt, pepper and cumin onto the wings. Place chicken into a resealable plastic bag. Pour marinade into the bag. Close the bag (try to remove as much air as possible) and shake to coat chicken with the marinade. 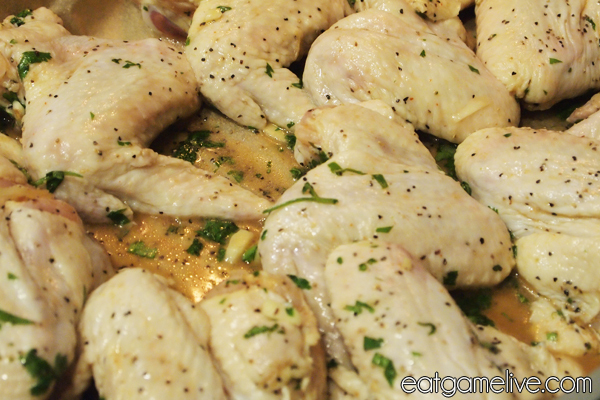 Place the chicken in the refrigerator and allow to marinate for 2 to 24 hours. After the chicken has marinated for your desired time, remove it from the refrigerator. 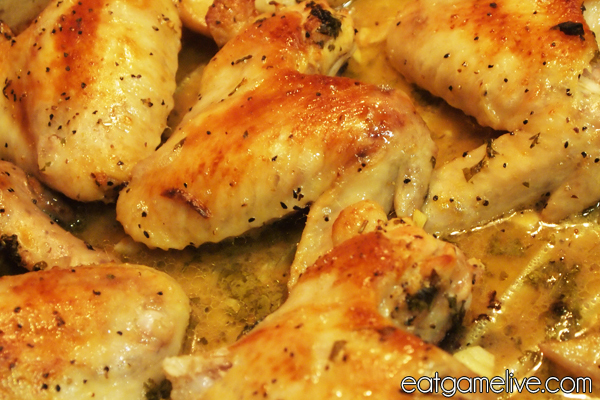 Place chicken in a baking dish. You can place parchment paper in the baking dish for easier clean up. Bake chicken for about about ~43 minutes. After the initial baking process, set your oven to broil. Allow the chicken to sit under the broiler for 2 minutes to brown the chicken. 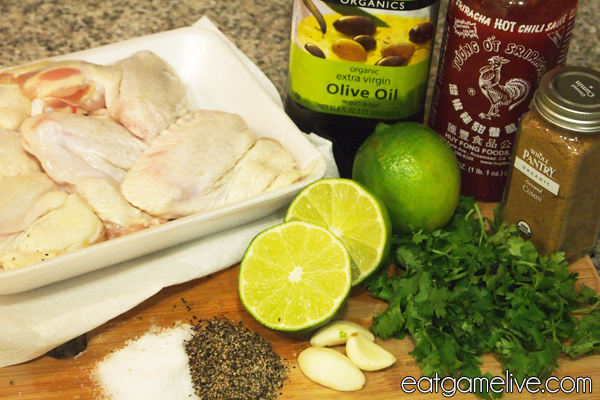 Remove chicken and garnish with lime slices and cilantro. 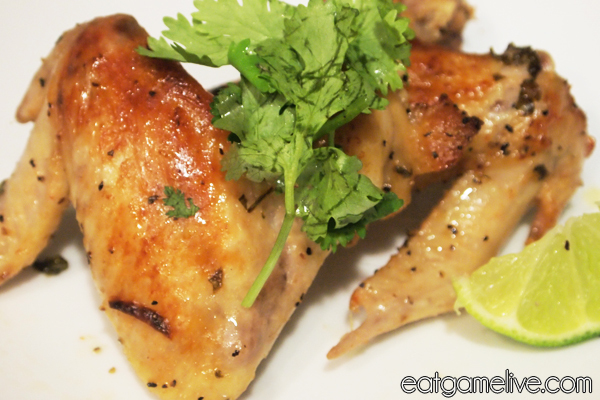 This is the perfect appetizer to share during a grand finals match. Split it with your friends and cheer on your favorite player! I’m a little sad that WoL is finally coming to an “end”, but I’m very excited for play the next installment of Starcraft 2. I was fortunate to try out the HoTS beta and I had the chance to mess around with the Warhound unit. It was horribly overpowered for what it was, but, I will miss you sweet, sweet Warhound. RIP Warhound. You will be missed. I have a similar recipe that I use to cook for my family but I use soy sauce and fish sauce for extra saltiness. Then I serve it with rice and a side of spicy red pepper dipping sauce (Lao Style).